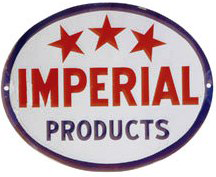 This is an oval Imperial Products porcelain sign. This particular Imperial Products sign is white with red and blue print. It reads, “Imperial Products” and features three red stars at the top.